Cassandra Leung is a young Reckoner trainer, raising genetically engineered sea monsters (a.k.a. Reckoners) to protect sea vessels from pirates. When disaster strikes during Cas's first solo mission and she's captured by the infamous Santa Elena, she's given an ultimatum: Train a Reckoner pup for Santa Elena's crew, or be killed. As a result, Cas dives head-first into the rough-and-tumble pirate world, and Skrutskie doesn't blunt its edges. The violence is bloody at times, and some readers might be turned off by the vulgar language - but hey, we be talkin' about pirates, matey! Their gritty lifestyle makes Skrutskie's world more authentic and Cas's dilemma more harrowing. What else did I love about The Abyss Surrounds Us? The Reckoners, of course. Bred from animal DNA including snapping turtles, snakes, and lizards, they're massive, destructive, and oddly lovable. especially Bao. Ethnic and sexual diversity are also well-represented. Cas is Chinese American, and her relationship with female pirate Swift is believable and complex. There's a hint of Stockholm Syndrome, since Swift is basically Cas's captor, but we get to see Swift's human side via secrets and vulnerabilities as well. She also prompts Cas to look at Reckoners from a new perspective and question the morality behind her training, which was really interesting. 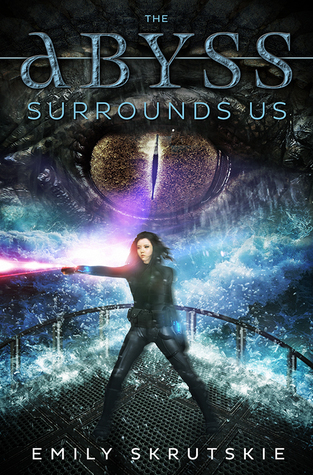 Sign into Goodreads to see if any of your friends have read The Abyss Surrounds Us. 15.38% "WOW. This is already a really cool story, and it's off to a rockin' start. :D"
38.83% "Awwwwww. I really like Bao, even though he's a vicious little creature. :)"
64.1% "I keep forgetting this is a relatively short book. It's hard to believe I'm already more than halfway through!" 80.59% "If this book has a strong finish, it will most likely be my pick for Read of the Month at my blog. ;)"